Let us cater your next events! Ready to wow your guests with delicious BBQ? Then don't waste any more time. 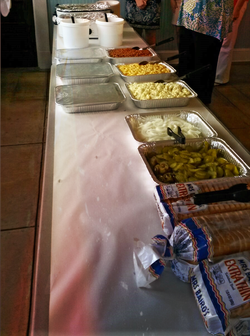 Whether it is a full service event, or deliver and set up buffet style and service for one hour. Book that BBQ quick! Prices include delivery and set up buffet style at your location on your tables. (Mileage rates will occur for sites outside of the city limits. (1.00 per mile both ways) We will serve meat and maintain the serving line for 1 hour. We're also available to stay longer if needed for an additional labor charge of 50.00 per hour for 2 people. Choose any 3 sides: pinto beans, jalapeno beans, baked beans, turnip greens, italian cut green beans, buttered new potatoes, mac and cheese, potato salad, cole slaw, cornbread and pea salad. Included is bread and condiments including: pickles, peppers, and onions. All paper goods, plastic ware and napkins. Tea is available for an additional 1.00 per person, which includes, cups and ice, sugar, sweet n lo and lemon packets. Tell us about your event and how we can help you!